Ghana: We finally get to play Ghana in the first round! I’m a believe in the third time being the charm, based on the highly scientific study of draw simulators I ran all day while my son was home sick. When Ghana was in our group, we got out of the group. This is the year. I believe that Klinsmann can make the US team believe they can do anything. He can lead the US to avenging our losses in previous World Cups. It will be a moment of spontaneous healing for soccer fans across the US. I can’t freaking wait. Portugal: Best game of my life was watching us beat Portugal in the 2002 World Cup. I met most of my soccer family that day, walking up to the stadium, and the game itself was the most amazing thing I’ve ever seen. They were #4 in the world, we were college kids with no clue. They had Figo, we had….mostly people before they were famous. That glorious moment when we scored in the third minute, my husband was shaking me and screaming “This is going to be the longest 87 minutes of my life!” You better believe I think we can do it again. No doubt. 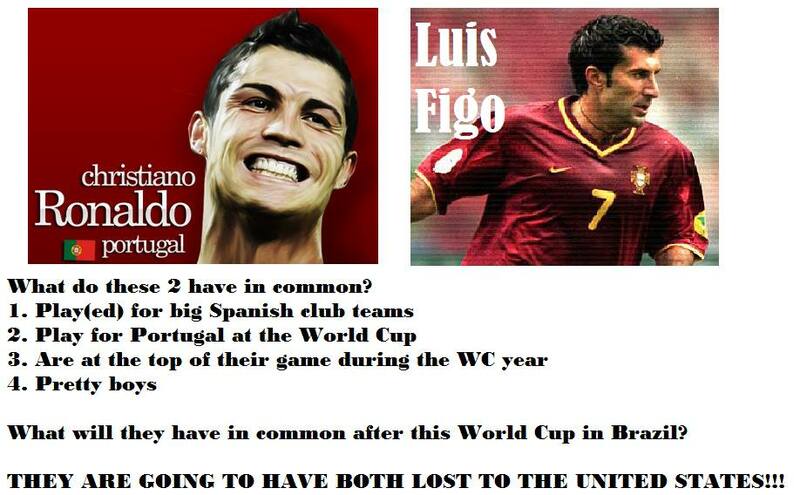 My only regret is that Ronaldo’s name won’t fit well into the “Agoos has more goals than Figo!” chant. (Side note: yo, USMNT…no own goals this time, my heart stopped after the Agoos goal and didn’t restart til the final whistle.) Relive that game? Yes please! GERMANY: The MOTHERLODE!! The team that brought me to US Soccer. That beat us in 1998. That sent us home in 2002. Who we BEAT THIS YEAR. Don’t give me your “Meh, it was a friendly” “It was their C team” Whatever. Klinsmann wants to beat Germany. I’d put money on it. Because he must have about 100x more German friends than I do, and is just as sick of hearing about how the German team is better than the US. Maybe some days they are, but not June 26, 2014. That is the day we will avenge this handball, and I will get to send a nice bottle of consolation wine to my German housefather, as he delivered to me after our 1998 loss. Klinsmann was on the team that destroyed us in 1998. He understands the game, the psychology, the bench, the players. He needs to play Ghana and two European teams, instead of needing to prepare for an African team, a South American team, and a European team. Already a job made more simple. But more importantly, he’s been inside the German psychological game. 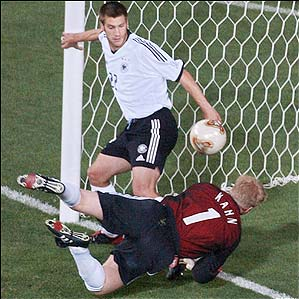 The 1998 US Soccer sports psychologist, when speaking about that game, told how Germany stood next to US Soccer in the tunnel, and in unison, turned to the US looking unimpressed and unthreatened, then in unison snapped eyes back front, leaving our boys without any hope of beating the German machine before they ever left the tunnel. Klinsmann was one of those players…oh sorry, he was the CAPTAIN. Heck yes I want him leading us into this battle! This is the year, I’ve felt it since we hired Klinsmann, this is THE YEAR. It’s not enough for me, just getting out of the group, and I cannot for the life of me understand why we’re just talking about getting out of the group, now or in 2010. It is un-American to not want to do better, strive for more than we’ve ever done, so let me tantalize you a bit with what awaits us on the other side of the epic battle we have in front of us. My geek husband ran the numbers on group “deathness,” much like MLS did here, only he used FIFA and ELO rankings. When you look at ELO, deathness is ranked (starting with most deadly) B, G, D, A, C, F, E, H. See, we’re not in the worst group (smirk). But what about the next rounds? Let go of your fears and look into the next round! If (when!) we escape the first round, we get to face the winners of group H. How’s that side looking? Not too shabby. You know who we face in the round after that?? E or F’s winner. Aw yeah boyeee!! I know, I know…one game at a time, but seriously America, get hungry. When we hired Klinsmann, I told my kids I thought he was the coach to take us further in the World Cup than we’d ever gone. I still believe. You should too, because it’s going to be an epic story next summer.